Something new in the house! Either Tegra K1 or Snapdragon 805 I would dare guess. A new Atom of sorts for the android market? Latest Allwinner is supposed to be very good, but it's octacore. PS: My best bet would be latest Rockchip, which might be good in this benchmark. Huawei Kirin or Samsung Exynos? Assuming 1890 is the stock max frequency, it can only be an SD600 or T40. KIRIN can only dream of that performance. MT only has 6595 in plans, and it's more on par with specs of SD800. Phone looks like it's slightly under 5 inches, and has piss-poor resolution, so my bet's on ZOPO or other crap such as Gionee. Pieter, what phone was it? 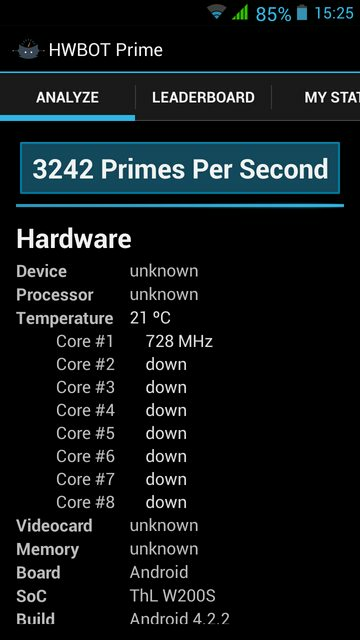 Just played with an octa 6592, scores an impressive 3000pps (unoptimized) at just 1500MHz@30oC, I reckon 2GHz on it will be on par with the 6595. Development phone; not an retail product.